Please first check if you are using v1.5.9 or v1.6. With v1.5.9 delivery of plugin updates via SSL was added to increase security. Unfortunately we found that although this features works fine, there might be issues on servers with outdated or incomplete SSL libraries. 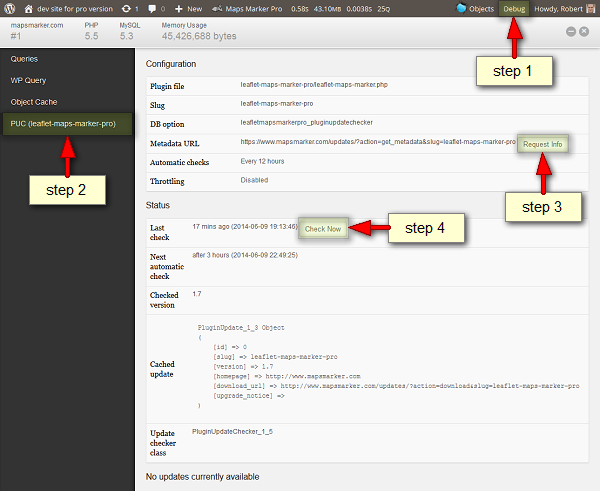 This can prevent your plugin to communicate with mapsmarker.com to check for new plugin updates. Please note: if you would uninstall and reinstall the plugin through the WordPress admin interface, all created maps would get deleted on uninstall, so please do a manual update via FTP if you have already created some maps! If you or your hoster cannot help you with the information retrieved from the debug bar plugin either, please open a support ticket and we will be glad to help you solving your issue!